SynergEyes, Inc., the worldwide leader in hybrid contact lens technology, has expanded parameters for its Duette Progressive lens. Parameters are now available in 0.1mm increments, which will facilitate even more precise alignment fitting, creating optimal centration and clear, stable vision at all distances for even more patients. A survey of 600 O.D.s verified the need for a high-performance contact lens for astigmatic presbyopes. “The vast majority of doctors said the most positive impact on their practices would be a better contact lens for astigmatic presbyopes. Expanding parameters of the Duette Progressive lens to 0.1mm increments will allow practitioners to optimize visual outcomes more successfully for even more patients,” said SynergEyes’ President and CEO James K. Kirchner, O.D. Utilizing a near center aspheric add zone in combination with a distance asphere, Duette Progressive provides a seamless progression of powers from distance to near, giving presbyopes GP vision at all distances along with soft lens comfort. 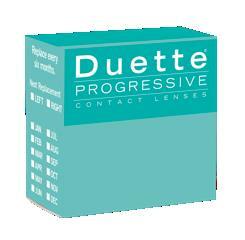 With a choice of three add powers to give the practitioner greater control over the visual outcome, Duette Progressive is a go-to lens for presbyopes with astigmatism and is also an ideal choice for moderate to advanced presbyopes who no longer get acceptable near vision from soft multifocal contact lenses. The lens also features an 84 Dk silicone hydrogel skirt around the 130 Dk center, and includes UV-blocking materials. Practitioners report successful outcomes with very few follow-up visits when empirically fitting the Duette Progressive lens, said Dr. Kirchner.